Brian grew up in Northern Kentucky, came to UK with the intention to obtain a degree in biology and attend medical school. Like many undergraduate students, Brian’s interests changed as he took more advanced courses and became involved in undergraduate research. He decided to pursue graduate studies in chemistry and, near the completion of his graduate degree, he provided answers to a few questions. (1) What made you decide to apply to UK? To accept the offer for admission? In high school, I received an award from UK for academic achievement; I traveled to Lexington for the ceremony and got to see the campus. I found that I enjoyed being on the campus and the surrounding area when I visited. I believed that UK’s focus on academic and medical research would also be useful to my future career. Finally, cost was a major factor influencing where I applied as in-state tuition was always more affordable. Accepting the offer for admission was straightforward as it was the school I wanted to attend (see above) and one of only a few schools to which I recall applying. (2) You were originally a biology major. What prompted you to change your field of study to chemistry? I changed my major when I was a sophomore. Taking organic chemistry I & II helped get me interested in chemistry, but participating in chemistry research is what convinced me to make the change. Broadly speaking, chemistry has always made more sense to me than biology. I understood it better and enjoyed learning about it more. In my opinion, biology was too much memorization and not enough application—so, I think, not intellectually challenging enough for me. I only hesitated changing my major because I was concerned about graduating on time. Cost was always a factor—see the answer to (1). (3) What course or courses were the most useful or interesting? Organic II, 538, and Synthesis were the most useful to me. To this day I still reference notes from these classes and I probably learned the most organic chemistry from these courses. Synthesis was particularly interesting because the subject was always so difficult for me. It helped me understand how to make synthetic disconnections and help teach others how to think about synthesis. 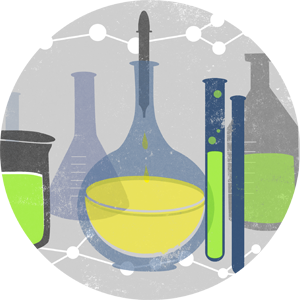 (4) How did research affect your outlook on the chemical sciences? It has inspired to me to share it with others but it has also jaded me. Research was eye-opening for me because it put my textbook knowledge into context. It requires that I be creative with chemical knowledge in order to solve major, real-world problems. That is, I can have a positive impact on society by using my creativity—a unique position to be sure! This is also a feeling I would like to share with other students of chemistry. However, research is always frustrating with no exceptions. Troubleshooting is a valuable skill to learn but it generally is not a pleasant experience. (5) What do you want to do when you grow up (graduate)? I’d like to teach at a primarily undergraduate institution (PUI) or a state school of some sort. Having a research program would be a plus, but I’d like to focus on the teaching. I have, however, not dismissed an industrial job as a possibility. (6) What advice would you give an undergraduate considering majoring in chemistry? Don’t do it. Just kidding. I would suggest getting involved in research early to find out what you like as chemistry is a broad field with many opportunities. Research offers one an insight as to what a day in the life of a chemist is really like. There truly is no substitute for it.